Fifth-grader Rupert Campbell lives in a world that combines Roald Dahl’s Witches and Louis Sachar’s Wayside School. 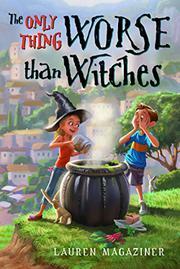 Absurd and magical, it is still informed by the trials of children: trouble with friends and teachers. Extremely mean, scary, strange and dangerous teachers. Mrs. Frabbleknacker refuses to allow the fifth graders to speak to one another—even outside of class. She has been known to physically pick up and throw students out of the room when they get on her wrong side. The day she makes the students search for one paper clip in Gliverstoll’s town dump, Rupert decides to change his fate. Infused with a Mr. Weasley–like curiosity, nonmagical Rupert yearns to learn more about the witches in the area. Against his mother’s firm directions, he answers an ad for a witch’s apprentice. Quirky and hopelessly dramatic, Witchling Two desperately needs to pass her exams to become a full-fledged witch, or she will be exiled. Rupert is her only, unlikely hope. Together, they struggle to solve two looming disasters—passing the exam and surviving Mrs. Frabbleknacker’s class! Magaziner’s youthful narrative voice is distinctly aural: Her characters swish and swoop, clomp and screech. Her storytelling cauldron mixes the right balance of bizarre and banal, and she turns up the heat as the witch exam approaches.